My iPhone 8's Home button surprisingly got cracked. Recently I have bought the iPhone. I have left the device like that on my table, but when I turned to check something I found my iPhone 8 home button cracked (a hairline crack). It doesn't respond to my touch now. Please help me! Though this problem seems uncommon, finding your iPhone in such a state must be painful. You may find you are not able to use touch ID or fingerprint since the home button of your iPhone is broken. However, since iPhone 8's home button (including iPhone 7's home button) is different from that of the previous models (we will explain that later), we could help you with some solutions to combat the problem before you replace the button. 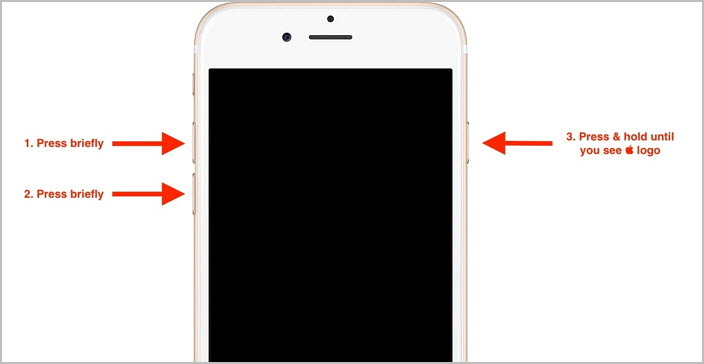 Go through this article to explore more about how you can use touch ID or fingerprint when iPhone 8 home button is cracked. Is iPhone 8 Home Button Replaceable? Why? Well! An iPhone 8's 'Home' button can be fixed only by Apple stores and not the mobile repair stores next door. The 'Home' button of your iPhone 8 works in sync with your logic board, which you can't change. Changing the 'Home' button would adversely affect the 'Touch ID' functionality of your device. iPhone models after iPhone 7 don't have a mechanical actuator anymore. It makes replacing the 'Home' button with a non-Apple one dysfunctional. This is because the iPhone 7 and later models don't have a physical 'Home' button, it is a non-mechanical one. The new button not only transmits fingerprint identification, but supports 'pressing' as well. The response you get (vibration) using the 'Home' button is due to the Taptic Engine encouraging the 'click' when pressed. This is a button shaped sensor for sturdy performance. The button is entirely controlled by the software and doesn't wear out easily. Hence only original iPhone button can interact with the logic board mounted within. So, if your iPhone 8 home button got cracked never let it get repaired by a local repair shop. FYI: Replacing the 'Home' button from Apple might cost anywhere between $99 to $600. You can check more details here. Apple has introduced software locks on iPhones to eliminate independent repair of certain iPhone parts, such as 'Home' buttons. Now, as the home button of iPhone 8 is software-controlled, some technical tips related software might help. You can try these tips mentioned below to fix the malfunction caused by cracked iPhone 8 home button. 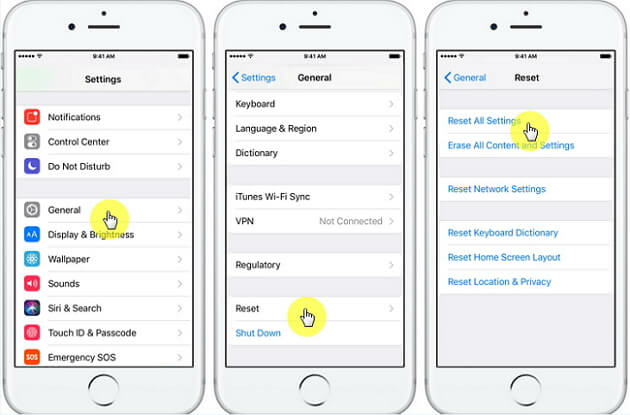 Hard resetting usually resolves most iOS glitches of your iPhone, so that your iPhone can work normally after restarting. Here is the step-by-step guide to perform hard reset on iPhone 8 or X. First of all, tap on the 'Volume Up' button instantly and release. After that click on the 'Volume Down' button in the similar fashion and lift your finger. Finally, hold down the 'Power' button and wait till the Apple logo beams on screen. Once the Apple logo shows up, wait for your iPhone to restart. This can probably fix the inconsistent functioning of the broken iPhone 8 'Home' button and make it functional. Another quick solution to resolve the iPhone home button issues when it is cracked is resetting all settings on your iPhone. Here is how to do that. On your iPhone, go to 'Settings' > 'General' > 'Reset' > 'Reset All Settings'. Upon prompted, type in your passcode (if any) and you are good to go. You can't completely turn down this feature, but it can be set to a bare minimum. Resetting 'Home' button intensity might eliminate the unresponsiveness of the 'Home' button post the crack. Here is the guide. Browse 'Settings' > 'General' > 'Home Button' > and then select '1' here. An activated 'Home' button can only be confirmed through haptic, as the button is not a mechanical one. It helps you feel that the button has been pressed. Connect your iPhone 8 to a pre-trusted computer and launch 'iTunes'. 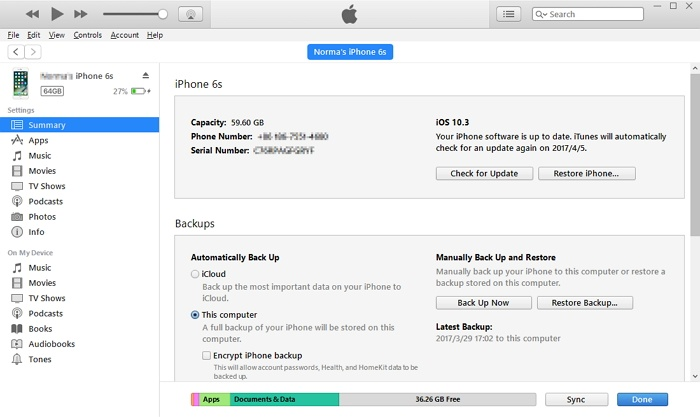 Your iPhone will be backed up to the computer. Launch iTunes again and connect your 'iPhone' using a lightning cable. Tap on your iPhone icon in iTunes > 'Summary' > Select 'Restore iPhone' in iTunes. Wait while iTunes restores your iPhone 8. Let it restart and your iPhone will restart like a new one. This should most probably resolve the insensitiveness of iPhone 8 home button after it got cracked. If it doesn't you should then hop on to next solution. If you want to restore your iPhone selectively from your previous backup, you can look for an iTunes alternative like iMyFone D-Port Pro for that matter. With this mighty tool, you can aso selectively restore WeChat, Messages, and WhatsApp data from your iTunes/iCloud backup to your device. 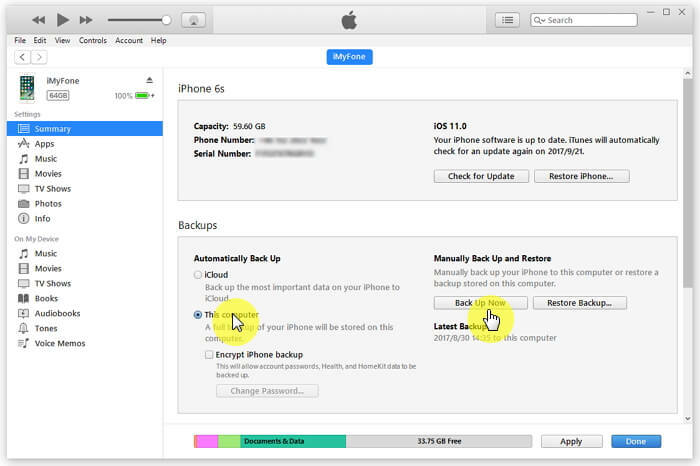 This tool allows you to back up your iPhone 8 selectively as well, and won't overwrite any old backups available on your computer. It supports extraction of more than 20 data types from your iOS devices including iPhone, iPad, and iPod touch. Furthermore, it is fully compatible with all iOS versions. On your iPhone, browse 'Settings' > 'General' > 'Accessibility' > 'AssistiveTouch'. You can confirm that AssistiveTouch has been enabled, if a dark square with a white circle is visible on your iPhone screen. This is the 'Assistive Menu' shortcut that appears on all screens. It is flexible to be dragged around the screen. Siri is also an option to enable 'Assistive Touch'. Browse 'Settings' > 'General' > 'Accessibility' > 'Assistive Touch' > 'Create New Gesture' > Tap/Swipe and create a new gesture > click 'Stop' on the bottom right corner. 'Save' > Name it > 'Save'. Note: You can tap 'Play' to preview or 'Record' to re-record a gesture. You can find these custom gestures under the 'Custom' section of the Assistive Touch menu. Alternatively, custom gestures can be added by clicking 'Custom' > tapping 'add buttons'.